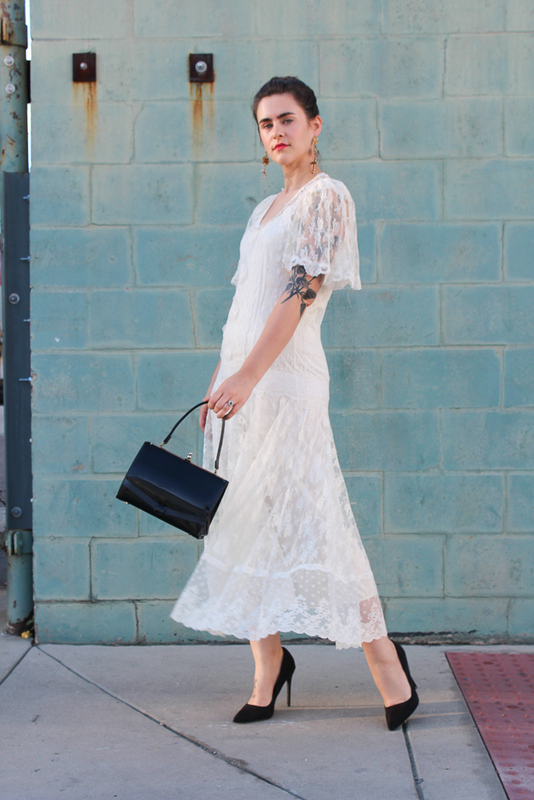 Outfit details: vintage lace dress, Free People earrings (also love these! ), Nasty Gal suede pumps, vintage wool blazer, vintage patent top handle bag. Makeup: Glossier Cloudpaint in Beam+Puff (my favorite makeup product ever), Glossier concealer, Marc Jacobs Velvet Noir mascara, Glossier Boy Brow + Anastasia Dip Brow, Mac Ruby Woo lipstick. Sometimes you have really pretty vintage dresses hanging in your closet and no occasion to wear them. Eventually, you have to throw caution to the wind and wear whatever you want, whenever you damn well please. There's no reason you can't wear a Victorian mourning gown to go pick up some matzoh and La Croix at Publix. TO BE FAIR, if you feel awesome in jeans and a tee shirt yes obviously rock it and do your thing. My point is that dressing up – especially sans occasion – can sometimes bridge the gap between how you’re feeling and how you want to feel.